We’re all in agreement that Amal Clooney wins best dressed guest at the royal wedding, right? That marigold yellow dress was everything. 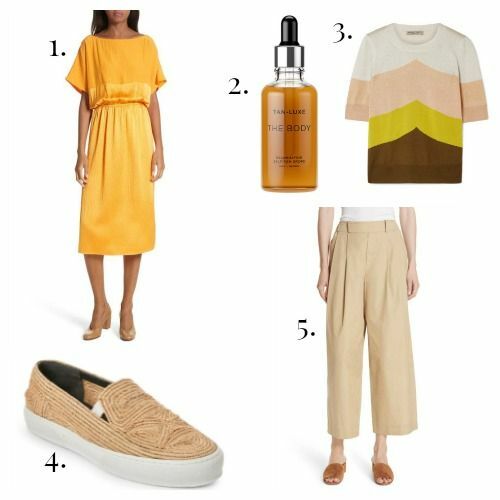 This Rachel Comey dress isn’t quite as dramatic as Amal’s custom Stella McCartney number, but it’s so much more wearable for non-royal summer occasions. Plus, it’s marked way down as part of the Nordstrom Half-Yearly Sale. This new self-tanner option has sold out more than once, and it’s not even June yet. Rather than using a standalone self-tanner, these drops let you turn your everyday body lotion into a customized self-tanner by adding a few drops. It also claims that it won’t streak or smell. I’ll believe that one when I see it. But, the customizable approach coupled with not needing to add another step to the daily body care routine is enough to sell me. This investment-level summer sweater has all the best warm weather shades rolled together into one chevron striped bundle of fashion goodness. These sale-priced slip-on sneakers are kind of like full-foot espadrilles. Very summery. They’re only available in limited sizes at this price, so if they are turning your head, I suggest snapping them up right away. Speaking of summery… these tailored cotton trousers are perfect for summertime in a business casual office. They’re also available in a navy blue shade called coastal.